Jaipur: The Commissioner for Metro Rail Safety (CMRS), Mumbai conducted a trial run last week. 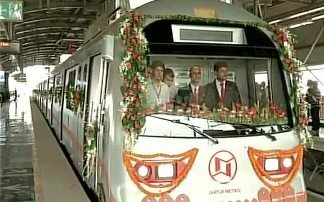 With this process completed Jaipur Metro is likely to run on Automatic Train Operation (ATO) mode soon. This was a much awaited request from the Jaipur Metro Rail Corporation (JMRC). The metro authorities had sent an application to CMRS requesting them to carry inspection between Mansarovar to Chandpole. The request was made to upgrade metro operation from Automatic Train Protection (ATP) to ATO. This request will finally see the light of the day if things go as planned. Project director of JMRC Ashwani Saxena informed that c Commissioner of Railway Safety (Western Circle) Sushil Chandra, conducted inspection on Friday night between 10 pm to 1pm. The trail runs were conducted successfully. JMRC is hopeful to start ATO system once they receive approval from the authorities. The Jaipur Metro officials are optimistic that they will get the permission soon post successful trail run. The good news is that once ATO is in place, metro trains will run without any intervention from metro drivers. The automatic system will take control of the operation including speed, braking, movement and various other functions. The role of metro driver will only be to press a button to open and close doors of metro trains at the stations. JMRC on the other hand conducted internal trials to test the ATO system during non-operational hours. These trail runs were conducted between Mansarovar to Chandpole stretch. Once ATO is in place it will reduce running time. The new system allows trains to be operated on high frequency and come with in-built safe mechanism. Driverless trains will improve train’s operation, are safe and reliable as well. In absence of a driver, the cabin will be decked up with safety features, ensuring smooth functioning of the train. CCTV cameras will be installed to closely monitor critical systems both in and out the metro train.